Solo can't provide more than a greatest-hits collection of Star Wars references. In the prologue to 1989's Indiana Jones and the Last Crusade, a teenage Indiana Jones (River Phoenix) has what could understatedly be referred to as a very eventful day. He picks up a bullwhip for the first time, leaving him with a chin scar; he also picks up a pathological fear of snakes. He even winds up with his trademark fedora. If there was a defining characteristic of adventurous Indy, we saw it born in that 15 minutes. And when Solo: A Star Wars Story was announced, creating a background narrative for yet another iconic Harrison Ford character, it was reasonable to wonder: Would this simply be the same sort of thing, a two-hour-plus version of the Captain America-in-The Avengers "I understood that reference" meme? So we begin with a young Han (Alden Ehrenreich) on the planet Corellia, orphaned and part of the shady criminal operation run by a Fagin-esque insect alien. Han is the kind of rascal who boosts speeders and gets involved in chases, dodging people who want to kill him with an irrational confidence that should seem familiar to anyone who grew up with Harrison Ford's roguish smuggler. That, however, feeds into a fundamental problem with Solo: If it's going to be the story of how Han becomes the character we know, then we're going to spend two hours in the company of someone who's not the character we know. Ehrenreich's performance feels trapped between these two competing goals—playing a larval version of Han Solo, and doing a passable imitation of Harrison Ford's Solo—and as a result it never comes together as a character that makes any dramatic sense. 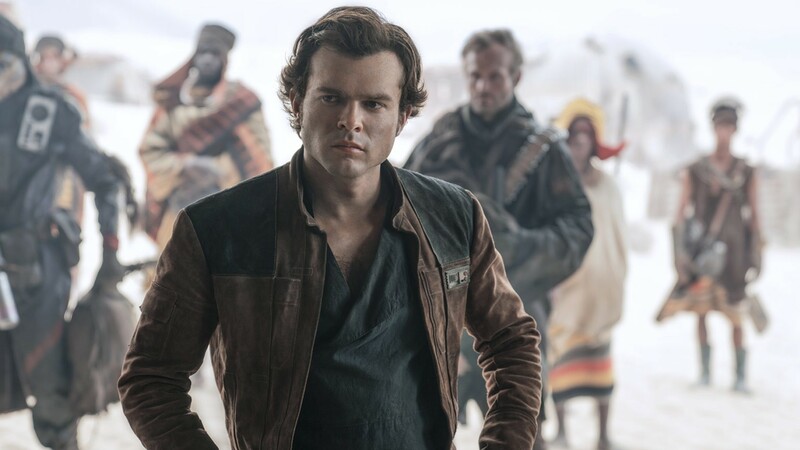 There are plenty of other characters in Solo, and fortunately they're able to pick up at least some of the slack. Woody Harrelson plays Tobias Beckett, a cynical mercenary who becomes Han's de facto mentor; Paul Bettany gets the villain role as Dryden Vos, whose facial scars become a kind of indicator light to the level of his agitation. Mostly, there's Donald Glover as Lando Calrissian, who is free to do a full-on homage to Billy Dee Williams' casual cool. It's a charming performance that combines the swagger of a gambler who's always got the fix in with a peacock whose obsession with a wardrobe made up of capes makes him a kind of anti-Edna Mode. Father-son screenwriters Lawrence and Jonathan Kasdan—the former of whom has been writing Star Wars stories since The Empire Strikes Back—try to pull all of these elements together into a narrative with a little heist action, a little space-jockeying, several awkward subplots about enslaved or subjugated beings and a fair amount of playful banter. But this is yet another franchise story that exists primarily to perpetuate the brand, and to congratulate its audience on identifying all the ways it tips its cap to previous installments. That means not only are we going to see how Han befriended Chewbacca (Joonas Suotamo), but we're going to get Han's jokey comment to the Wookiee that "you're gonna need a nickname." Solo just keeps playing the greatest hits, from how Han got his familiar blaster to the Kessel run to bits of recognizable wardrobe. When John Williams' theme music swells the first time Chewbacca sits in the Millennium Falcon's co-pilot seat, it's practically an elbow in the ribs: This is a cool moment, because of its association with a cool moment you experienced many years ago. It's no secret that the production of Solo involved a change in the director's chair(s), as Phil Lord and Chris Miller were fired and replaced by Ron Howard, whose association with Lucasfilm goes back to Howard's work on Willow 30 years ago. There's no way of knowing if Lord and Miller's preference for being subversive about genre movie tropes—evident in both The LEGO Movie and their 21 Jump Street features—would have resulted in something friskier than what we get from a workmanlike professional like Howard, nor is it even clear what footage here was supervised by which director. That, however, is Solo in a nutshell: A movie that might actually have a unique story to tell, except that its primary function is to keep the fans happy. You get the blaster, you get the Falcon, you get the Kessel run, but once you've got those references, there's nothing more to understand.